“You will never work again”, the bald statement the consultant presented me with nearly 20 years ago. It was a year after a silly accident that changed my life and left me with a partial disability. I was a single mother, with a mortgage and no other means of support. It was a very, very dark day for me. But here I am, 2018, my life is very different. I work for myself creating and maintaining websites. I managed rooms on Airbnb. I have a side hustle of FBA and I am now a travel blogger. In those dark days, all I wanted to do was to support my son and mortgage. However, I have reinvented my life and the choices I have made prove the consultant and everyone else wrong. I could and do work with a disability. Twenty years ago on 31 August 1998, my 9-year-old son and I had just returned from a holiday in Germany. I was cleaning out a tall rabbit hutch (we kept pet rabbits and had a stacked cage which was over 5ft tall). There was one piece of dirt left in the corner that I couldn’t quite reach no matter how hard I tried. So I threw out my right arm in the vain hope that my arm would lengthen and I would reach the elusive piece of dirt. Instead, I felt a very sharp pain in my neck and dropped the brush. Not quite sure what I had done to myself, I finished up and went to rest with my neck throbbing and swollen. Over the following month, the right side of my neck remained swollen and painful and when the pain started down my right arm and hand, I went to the doctor. The doctor dismissed it as a strain and sent me to see an osteopath for manipulation, but this proved too much pain for me to tolerate and if anything it became worse. I woke up on the first of October unable to move my neck or my right arm. I had to awkwardly roll myself out of bed and struggle to get dressed – bras are a nightmare when you only have one arm! A taxi to the doctors and I was signed off from work. I would not have a conventional job again, but at the time I didn’t know it. The months passed and while the complete paralysation of my neck and arm eased, every day my arm would lock and be unusable. The painkillers I was given went up and up in strength. I attended physiotherapy and tried to turn coins with my fingers. I was sent to have acupuncture, a chiropractor cracked my bones, but no-one seemed to address what had actually happened to me. I was even sent to a psychiatrist to see if it was all in my mind. At the beginning of 1999, my job as a CAD technician was terminated due to “frustration of contract”, basically I could not do the job that I was employed to do. It was another blow, but understandable in the circumstances. I was now on Incapacity Benefit and my outlook seemed bleak to me. I was learning to cope with the restrictions in my life. Instead of saying that I couldn’t do things, I told myself that I chose not to. I chose not to drive, I chose not to carry bags on my right arm, I chose to ignore the quizzical looks I got when my arm froze when I was out. Choosing not to wear a bra some days as I couldn’t do it up. Choosing to stop wearing clothes with buttons as my fingers could not fasten them. Choosing to put a smile on my face to greet my son, and keep my tears to myself. I didn’t understand what was going on with my body, and so went into my mind and read countless self-help books, all from the library as I chose not to buy them – Conversations with God, the Celestine Prophecy, You Can Heal Your Life amongst others. I went over my life and worked through my demons and tried to heal the inner me of hurts and injustices, whether real or imagined. Finally, 8 months after my accident in May 1999, I was given an MRI scan and the results revealed that I had dislodged my C5 disc in my neck. Had the doctors discovered it earlier, I could have been treated and would not have sustained nerve damage, but then I would not be where I am now. A month of outpatient physiotherapy to help me with life skills only taught me how to make a woven basket. I turned down to the chance to learn macrame or to make a woven stool and instead took on the task of reinvigorating the atrium garden, a skill I knew that I would actually use. I was banned from computers as I was told they would make me worse. I was told that I should learn to write with my left hand and become left-handed, but I knew my psychology and if I said I was left-handed, I would give up on my right arm and it would become useless. At the end of my month, my consultant told me that I could go back to “my little typing job and that I could do it for maybe 10 minutes in every hour and the rest of the time I could file or make tea.” Oh dear, the wrong thing to say to me. I pulled myself up to my full height and in very measured tones told him “I do not type. I design big f**k off houses that people like you buy and my bosses were so understanding that they fired me. So I have to go to an agency and say that I want to earn £25,000 a year but I can only do my job for 10 minutes every hour and the rest of the time I can file or make tea, and you REALLY think they will give me a job?” and turned on my heel and walked out. A month later after giving me a very painful examination, the consultant uttered the fateful words “You will never work again“. I had just turned 35 with a lifetime of not being able to work again stretching in front of me. I was awarded DLA – Disability Living Allowance – and classed as partially disabled. I stopped going out or seeing friends and I fell into a deep depression. I am ashamed to admit, I drank every day for the month of August. Still depressed, I decided in September not to accept the prognosis I had been given. I was an intelligent, resourceful woman who had brought up her child single-handedly, how dare he tell me what I could or couldn’t do! I immediately stopped drinking and hit the internet to find a job. Back then the internet was not the fabulous all singing and dancing place it is today and a lot of sites were not exactly polished. I looked at many sites and in my head, a small voice kept saying “I could do better“. The small voice became louder and louder, and I eventually challenged myself to do better. I went to the library and selected books on HTML, Photoshop and website design. I devoured them, spending all the hours I could at my computer learning code. My life had meaning again, and I could see a way out of my depression and turn my life around. My condition was not improving and the painkillers were getting stronger, but still, I persisted. I was also learning to mask my disability by sitting or standing in a certain way so as not to draw attention to my arm. My fingers were starting to lose sensation, so I frequently burnt my fingers, cutting or grazing them without realising. Within six weeks, I was confident enough to approach my McTimoney Chiropractor and offer a website instead of paying for my bill. My first client! I went on to do an Introduction to Business Course, and on 28 February 2000, I set up in business offering domain name registration, hosting and website design. This was 4 years before Facebook or any other social media platforms. Over the years, I have built up my client base of local, national and international clients. I taught myself ASP, CSS, PHP, databases, WordPress, SEO, set up Social Media for clients and worked wherever I was in the world. Although mainly based in the UK, I was kind of a digital nomad from the start. I titled this “A Happy Accident”, this is how I have chosen to view my accident. I was a single mother and it gave me the chance to have time with my son as he was growing up. It made me stronger and resilient and made me realise that if I could handle being partially disabled, I could handle anything. 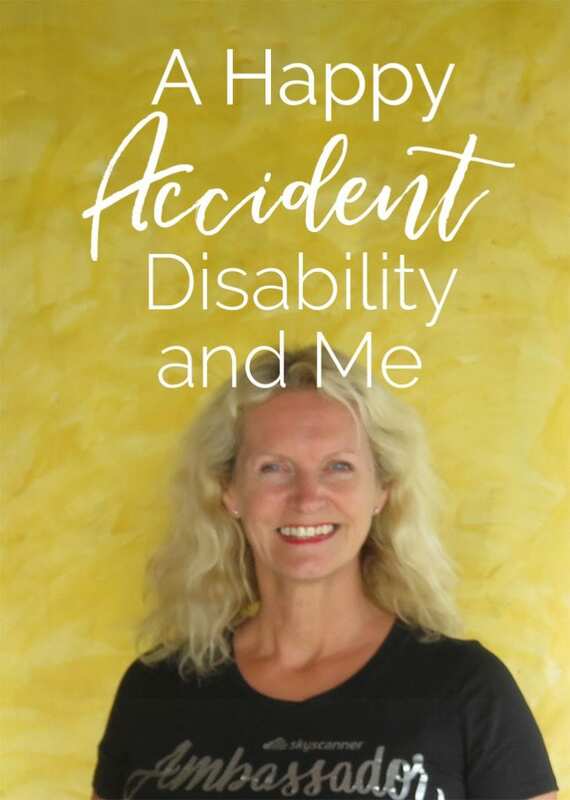 The accident took me away from a job where I worked long hours, was stressed and gave me the option of working for myself to fit in with my disability. The choices I have made over the last twenty years have brought me the life I lead now. When a lot of my contemporaries are looking to slow their lives down, life after 50 has accelerated for me. I reconnected with an old boyfriend, Alan, and our lives have blossomed. We started housesitting and travelling together. At the end of 2015, we started renting one of the rooms in our house on Airbnb. We now rent out four of the rooms and have a steady income from it. I tentatively tried FBA – Fulfillment by Amazon – in 2017 with great success and I am just about to launch my first private labelled product. (Email me if you would like to learn more). I have wanted to start a travel blog for a long time, I registered domains, but couldn’t quite bring myself to publish anything. I finally bit the bullet in 2017 and enrolled on The Bloggers Course run by Monica Stott of The Travel Hack. Her course gave me the techniques and confidence to put fingers to keyboard and start this blog. I also attended The Bloggers Retreat which she ran with The Twins That Travel which spurred me on and gave me more direction. This has been a very difficult post to write, and I have shed many tears while doing so. It is not meant to be a pity party, but it has been hard reliving the more painful aspects of my accident. My arm and neck still locks every day, sometimes for minutes, sometimes hours and sometimes days. I still take painkillers when the pain gets really intolerable, and there is always a level of pain every day. But I will not let my disability define me. Whether you have a disability, lack of money, direction, in a bad relationship or you are in a situation that you do not want to be in, there is always another way, you CAN change your life. Believe in yourself, I believe in you! Really inspiring. Thanks so much for sharing. Thank you Melissa! I hope it inspires you to keep on no matter what life throws at you! Hope to get over the pond to see you! Larch, this is such an amazing and inspiring post. I NEVER would have known this about you! It’s brilliant that you have carved a life for yourself, and have not been boxed in by what you might not be able to do – you’re fully focused on what you CAN do. I’m so inspired by you, and by how bravely you got through what must have been an incredibly difficult time. Thanks so much for sharing this! Thank you Elle. It has been tough in places, and sometimes still is, but I couldn’t give up on myself. As you say I focus on the things that I can do and being as positive as I can. You are also an inspiration, blogging, social media-ing and now an accomplished writer, my hat is off to you! No matter how difficult life gets, we must no accept and push ourselves forward & beyond. What happens to the rest of our lives is up to us. You are an I nspiration to the rest of us women!! Thank you, Lisa, for your kind words. Having spent time with you recently, you too are an inspiring woman who has built a business, come out of the darkness of raising a sick child and is an amazing cook and you will get to Bali one day, I promise! Dear Janice I am so sorry to hear that you have been in hospital for so long, which I know can be so dispiriting. Thank you for your kind words. Sometimes we hide what is really going on with us for fear of being judged, or being less than perfect (if such thing exists!) or less capable. I have found over the years that by listening to my body, I harness my strengths and respect the less strong areas of my life. Keep fighting you wonderful woman!! What a facinating and brave story. Looking foreward to spend time with you again together wirh F1GPDC. Thanks for sharing this. I feel I know you so much better this way and am more keen on us meeting in person some day. Alan is such a great guy and I just knew you would be interesting, but did not know your story. I had an awful back issue that was acute pain, followed by years of trying to manage pain and get more mobile. I know this issue well! I am so glad you have found a way to keep your thoughts high, the key in my estimation. Thank you Laurie. I had an issue with my back when I was in my teens so I can empathise with you. I look forward to the day our housesitting paths cross. That is a wonderful article Larch. Good on you. Keep smiling and keep fighting. Life is what you make it. You are not only an inspiration but an aspiration. Thank you Larch for opening up to us and sharing your story. You have been so courageous and reading this is really inspiring. I am amazed by your resilience and your determination! Hooray for you not to give in but fight! You have come a long, long way and with the confidence that you can overcome the prognosis and be what you want to be. I am so happy to have met you and Alan and even with your disability, one would never know that you had a physical problem. Mentally you are always up and I believe that being positive is one of the ways to go forward. So glad you shared this blog with the “world.” Keep up the good work, don’t let anything get you down and, hopefully, some day you may surprise yourself and have less and less pain. I will keep my fingers crossed. Thank you so much for your comments, Sharon. Your friendship means a lot to me. Ironically my blood group is B+ so all I can ever be is positive!! I love sharing our book suggestions and will keep it up when I leave Guanaja. Your friend, Larch de resto del mundo! Thank you Anne. You are right, it does get me down, sadly you get used to the pain but I know that whatever happens to me, I have the skill to overcome it and reinvent myself again! Yes the new product is the one we discussed and one will be winging its way to you when I get back to the UK! Wow! What a great post. A true life story about being at rock bottom and working your way up. Very impressed and massive well done!